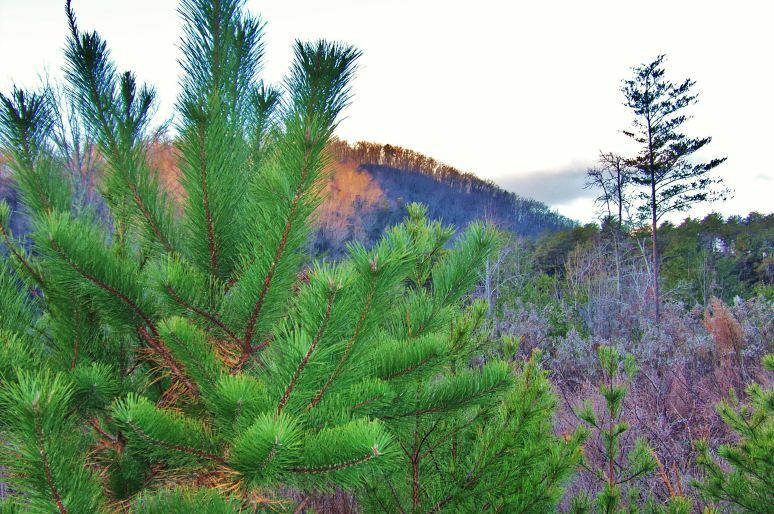 When you talk about pine trees in the South, usually you use names like Loblolly, Virginia, Short and Long Leaf, but you rarely hear tell of the Pitch Pine. 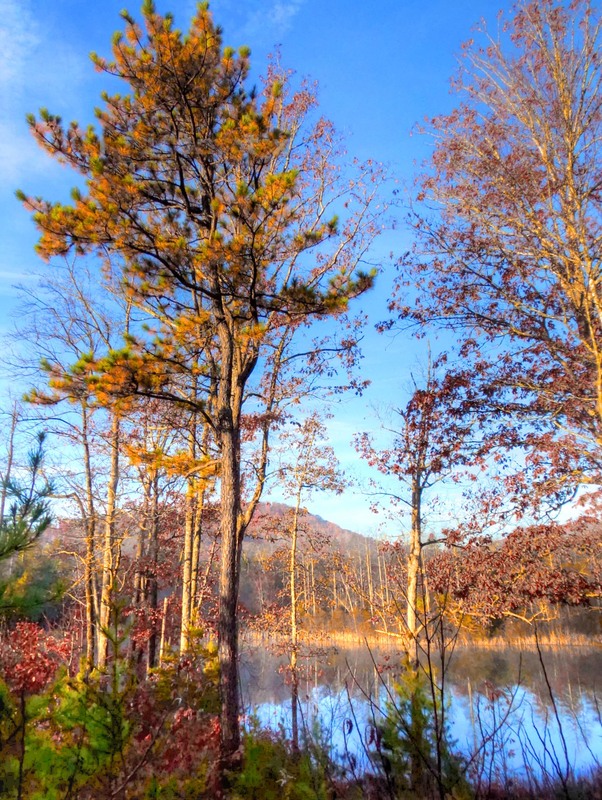 Throughout New England and the Mid-Atlantic states, the Pitch Pine, or “pinus rigida”, is common, but south of Virginia, they are found only in the mountains, and usually the higher mountains at that. Three years ago I found this unusual pine in a field north of my house. It was very different from any pine I had seen before. The needles were a deeper green, and the length of them was uniform along the limbs. 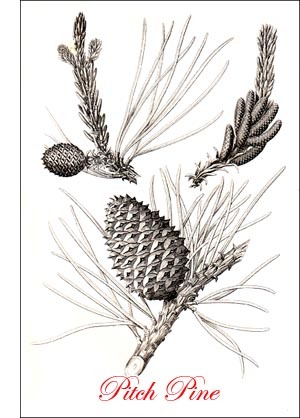 It resembled the Table Mountain Pine that grows on rock ledges in higher elevations. These images from last week are of the same tree three years later. Notice how the needles on the trunk and inner limbs have turned a deep yellow in the fall. Those needles will turn brown, and remain on the tree for years. So far this tree has not produced cones, but that should happen when it is five years old. 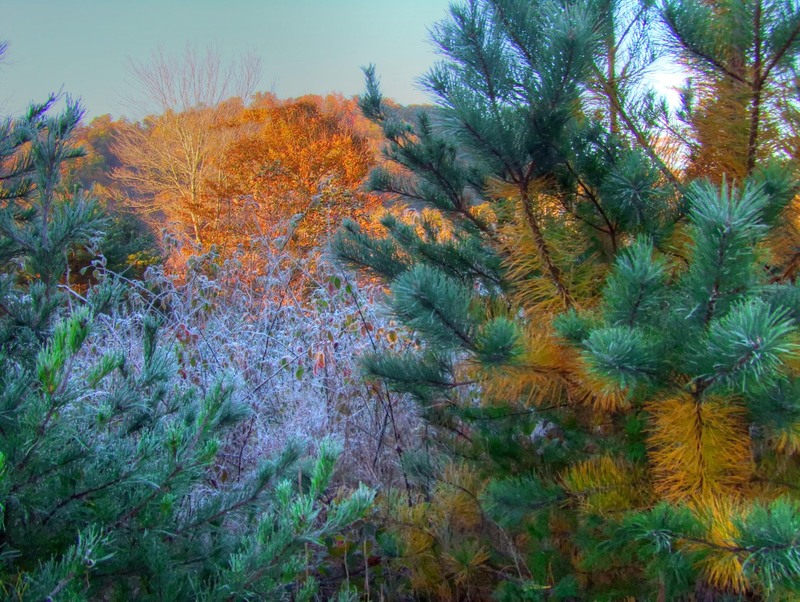 Last year I found a tall mature tree on a slope above Otter Pond a quarter mile to the east of the smaller one. 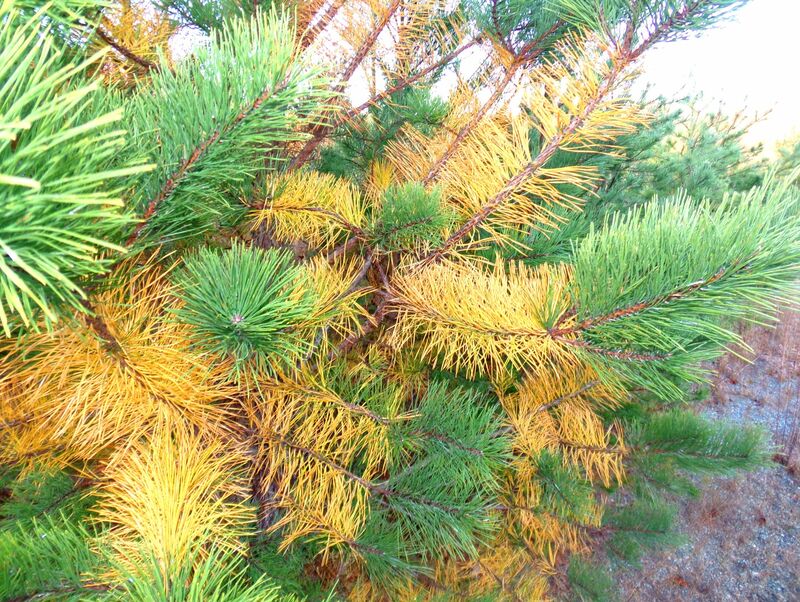 I wasn’t sure at first, but when I saw the yellow needles last week, I was convinced that it was a Pitch Pine. The greens are the same, and the way the yellow needles cling to the limbs seems unmistakable. The images above were taken from the internet, and show the botanical drawing of the tree, as well as the growth range, sap formation, and needle detail. Click on the thumbnails for the full image. 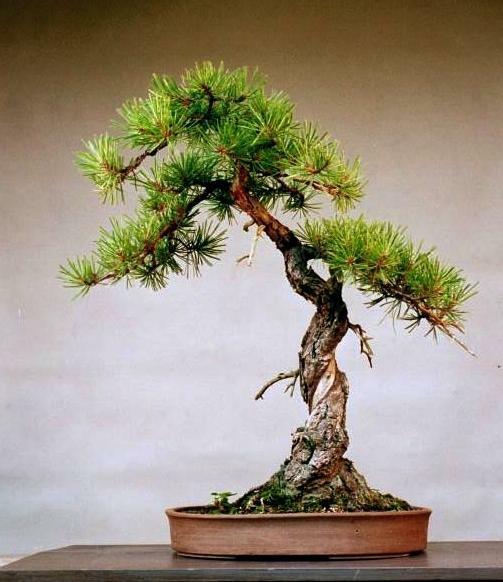 The Pitch Pine is a favorite among Bonsai collectors because of its classic needle design and the texture of its trunk. They are one of the easier pines to adapt to the art of Bonsai. 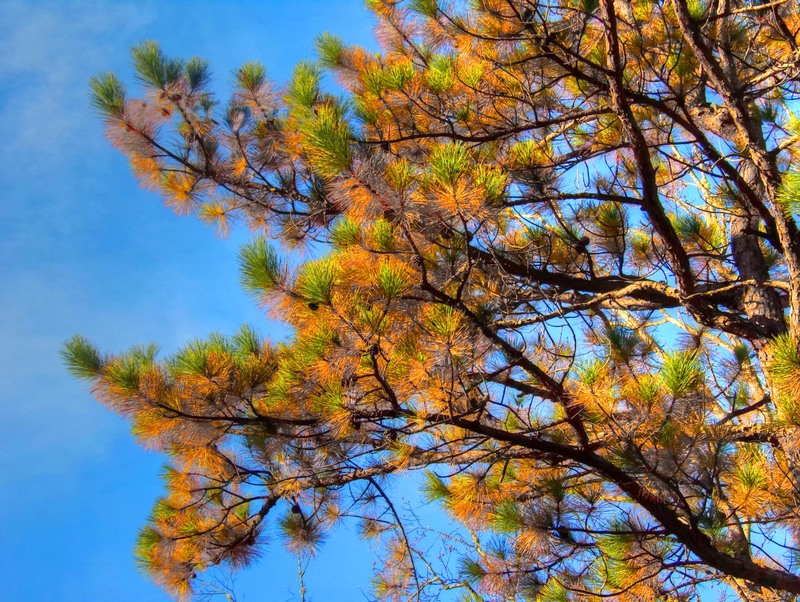 Pitch pine also is known as hard pine, black pine or yellow pine. It grows on dry ridges and slopes in the mountains and outlying hilly regions at elevations up to about 4,500 feet. The tree usually grows 50 to 60 feet tall, with trunk diameters of 1 to 2 feet. It can be found scattered or in small groups with hardwoods or other pines. 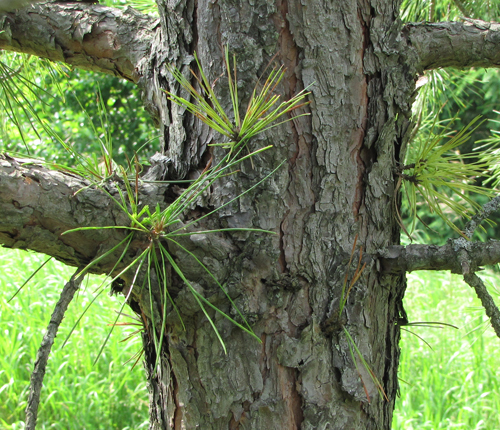 Pitch pine needles are 3 to 6 inches long, rigid, dark yellow-green and are marked on three faces by numerous fine white lines (stomata). Needles are in three-leaf clusters. Cones are 1 1/4 to 2 3/4 inches long, have scales tipped with curved, rigid spines and remain on the tree for several years. The branches often are thick, contorted and pendulous, giving the tree an irregular, ragged yet picturesque crown. The bark is broken into thick, plate-like scales that are yellowish-brown on older trees. Tufts of needles often are found along the trunk. 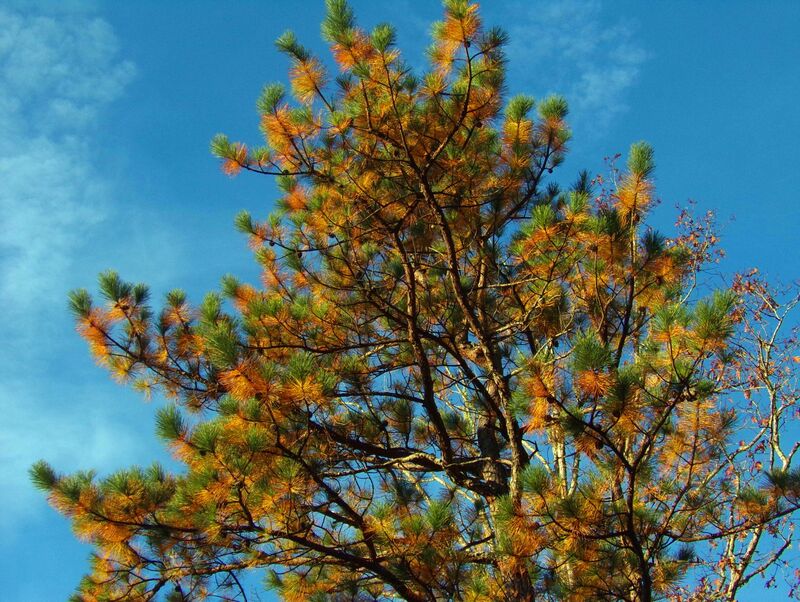 Pitch pine is used for lumber and pulp, and minor wood products. The dense resinous wood was popular for shipbuilding because of its thick “pitch” or sap. Wild boar in the southern Appalachians dig out the roots of this pine and eat their bark and soft outside wood.